Steered only by the river current, the boat is left to the mercy of wild Nature. There arises a certain tension between the water and the people in the boat and an expectation that something is about to happen. The river causes the people to be perpetually upset, lost and drowned in the strange and restless environment. 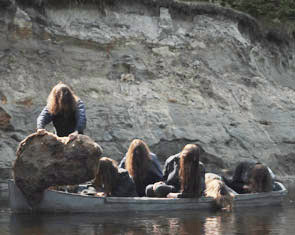 People concealed by trees and bushes, a strange creature hiding in the water, faces covered by hair – all create an atmosphere of obscurity, secrecy and invisibility. The vagueness and mysteriousness of the actions as well as the unsteadiness of the arising images lead to an anxious observation of Nature and represent the theme of human hopelessness and despair.